The set contains 10 super flexible blocking wires 35" (90 cm) long each and 30 Nickel plated T-Pins. 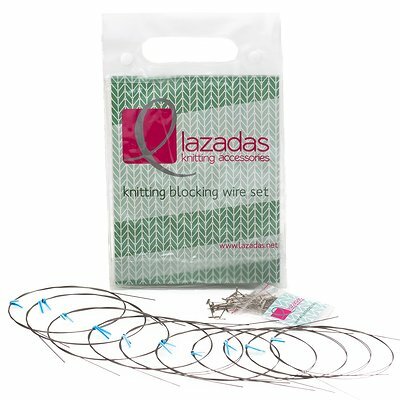 The Lazadas blocking wires set is used for shaping and setting knitting or crocheted projects after they are made. By blocking your finished garments you will put a professional finishing touch, it will help to smooth and uncurl edges, open lace works and shape the pieces to the exact measures you want. These wires are super elastic, can be bent, but have the ability to snap back to a straight wire. They are the most versatile blocking wires, they work great for straight edge, circular, half moon and even scalloped shapes. Because of the medium diameter, you can use it for blocking fine lace to chunky yarn projects. They won't rust on your garment and they are hard enough for long durability. This set is perfect for blocking small and medium projects like shawlettes, sleeves, sweaters and cardigans. If you have any questions about this product by Lazadas Knitting Accessories, contact us by completing and submitting the form below. If you are looking for a specif part number, please include it with your message. Ablet Knitting Abacus Row Counter Bracelet, Painted Rainbow, 3-Tier - Count Your Rows In Style!